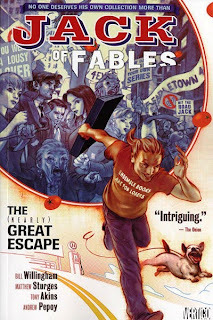 Fans of fairy tales, legends and lore, myth, magic and mayhem will find exactly all these things and more in the on-going comic book series Fables. First printed in 2002, author/creator Bill Willingham has guided this epic for the last seven years and shows no signs of stopping. In fact, the series is getting even bigger. The Story: As a tremendous enemy laid siege to the Fable homelands, heroes and villains alike escaped to a place where their 'Adversary's' minions could not reach: our world, the 'Mundy' world. Now, having rebuilt their society over the last 300 years, Fabletown lies cloaked in the heart of New York city. Snow White runs the Fabletown office with BlueBoy and Buffkin the flying monkey (easier than running a household for seven dwarves). Old King Cole is an ineffectual mayor, and must run against Prince Charming in the next election. The big bad wolf (aka Bigby Wolf) is sheriff, Jack Horner is the local miscreant, and the pirate Bluebeard has bought his position in the community. Non-humanoid Fables live elsewhere on the 'Farm' These include the rebellious three little pigs, Shere Khan and Bagheera, Thumbellina and the Cheshire Cat. It seems that for as long as a Fable's story is told, the Fable lives forever. The more it is told, the more powerful the Fable. And since they know about this, it is one of their highest laws not to fool with Mundy storytellers. Which is exactly what Jack Horner did in 2006, when he financed his own trilogy of Jack the Giant-Killer films. This super-charged him, made him a lot of cash, and prompted his expulsion from Fabletown. Thus began his own irreverent spin-off series: Jack of Fables. On his wanderings, he travelled the American Fablelands with Paul Bunyan and three spunky librarians, cheated Lady Luck and the Belgian mob in Las Vegas, and escaped from / returned to / defended / destroyed the Fable prison Golden Boughs. He also duct-taped Humpty Dumpty back together again. In the Spring of 2009, Jack and the Fables reunited against an inconceivable foe in the aptly named mini-arc The Literals. Such characters included the Pathetic Fallacy (aka Gary) and the Genres. The plot? Save reality from being edited. To close 2009, three new spin-offs loom. 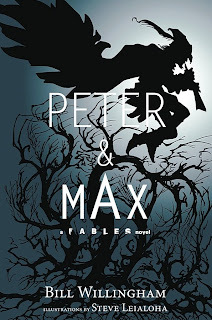 Peter And Max is Bill Willingham's first Fable novel, telling the story of the Pied Piper and his big brother, skirting the edges of the core narrative. Cinderella: From Fabletown with Love is a mini-series about Fabletown's best secret agent and shoe seller And recently promised by the scribe himself at the 2009 San Diego Comic-Con, Fables: Werewolves of the Heartland will focus on the lone Big Bad Wolf as he seeks out a new home for his people. 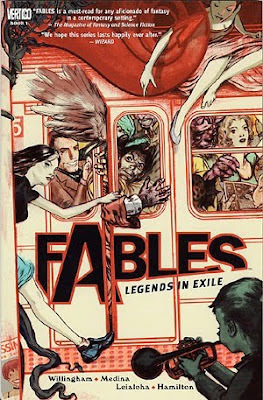 To date, Fables has won twelve Eisner Awards from both writing and art. It has been optioned by both NBC and ABC for a live-action drama. Even the anthology Fables Covers: Art of James Jean sold out from its limited print run. You could say its Willingham's golden goose. I loved this series and am thrilled to hear that Willingham has written more. Thanks for the info.